I would mark this little 117 page book down as a "must read" if you are a Christian or are considering becoming one. Why? Because it is subtitled, "Assurance of Purpose in the Midst of Suffering." Since Christians are assured suffering in this lifetime, it is good to think about the topic, study it, dwell on appropriate scriptures that relate to it and come to the conclusion (sooner rather than later!) that even though we suffer - God is good. That the point of the message that this book is delivering. 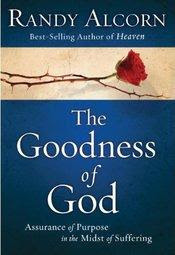 In this book, The Goodness of God , Alcorn takes a look at the concept and reality of suffering and discusses how Christians should expect it, welcome it and view it through the eyes of scripture. I know this is a topic that I touch on a bit here and there with some frequency but it's an important one - not just because of my past because of my future. Whatever suffering I may have already endured in this lifetime, I can rest assured that my struggles with it are not over. Until I have said goodbye to this world, I will continue to face struggles, pain and difficulty. My only hope is that I can learn more about who God is and learn to deeply trust in His greater plan which is for my good. "Evil and suffering have a way of exposing our inadequate theology. When affliction comes, a weak or nominal Christian often discovers that his faith doesn't account for it or prepare him for it. His faith has been in his church, denomination, or family tradition, or in his own religious ideas - but not in Christ. As he faces evil and suffering, he may, in fact, lose his faith. But that's actually a good thing; any faith that leaves us unprepared for suffering is a false faith that deserves to be abandoned. How can sorrow and pain be the best thing that ever happened to us? That's the question that Alcorn spends most of his time addressing in this book. Yes we will feel pain but that's not because God is "out to get us" anymore than He is out to be our personal genie in a bottle. When our pain lasts longer than we'd like it to, it's because God has a great purpose in it and a lesson to teach us. As strange as it may feel or seem, when your heart is breaking the only perfect balm is truth. We cannot say, "If God really loved me, this would never have happened." It is exactly because God loves you and has a great plan for you that whatever happened, happened. Assurances such as these offer solid hope. Fighting against the facts may make us feel better (although most of the time it just makes us feel frustrated) for a moment, but acceptance that God is sovereign, holy, just, kind, full of compassion and great mercy, love and goodness is the best medicine and the only way that we can live through the pain. Because that is the goal, is it not? To see through the pain and accept that we are finite and only see a little piece of a great puzzle. The sooner we grasp hold and say the words, "God - I trust you!" the sooner He can begin the healing process. And it will be good. Because He is good. All of the time. Whether you are currently in the midst of pain (and need assurances), have just come out of it (and need some confidence) or know you have more of it in your future (and need to prepare for it) - I would say that The Goodness of God is a must read. Thanks, Multnomah Publishers, for printing a faithful message of truth for Christians to be encouraged by and for sending a copy my way. Wow-what wonderful truths! Thanks for sharing them. I think this is one of the hardest concepts Christians have to wrestle with, and one time through is usually not enough -- I know I have to work through these truths often.